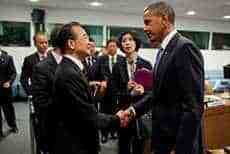 Home World Asia Is United States Wanting to Contend China? Is United States Wanting to Contend China? As China emerging as powerful country in the 21st century, the United States of America today underscored that it welcomes a strong, prosperous, and successful China. In her remarks at the Strategic and Economic Dialogue U.S. Press Conference in Beijing, US Secretary of State Hillary Rodham Clinton said the United States is not wanting to contend China as it shifts its strategic focus eastward in the high profile. She stresses that countries and their peoples gain far more from cooperation then from competition, so we are committed to pursuing a positive, cooperative, comprehensive relationship. She underscores 4th Annual Strategic and Economic Dialogue will be used to maximize mutual understanding and areas of cooperation while also speaking frankly to one another about those areas about which we have disagreements. United States and China are trying to do something that is historically unprecedented, to write a new answer to the age-old question of what happens when an established power and a rising power meet, she underscored. The United States see this as an opportunity, not a threat, she addded. Both countries believe that neither of them can afford to keep looking at the world through old lenses, whether it’s the legacy of imperialism, the Cold War, or balance-of-power politics. Both countries are trying to build a resilient relationship that allows both of nations to thrive without unhealthy competition, rivalry, or conflict while meeting their national, regional, and global responsibilities. On May 2011, Secretary of State Hillary Rodham Clinton stressed that both countries are building a lot more of understanding and trust. The United States and China have agreed to pursue a number of priority areas of cooperation, which were originally agreed to in October 2009. These areas include improving maritime security, which includes search and rescue; humanitarian assistance and disaster relief; counterpiracy; counterterrorism; maintaining peace and security on the Korean Peninsula; preventing Iran from obtaining a nuclear weapon; and addressing the spread of nuclear, space, cyber and missile technology.